Home / Editor's Choice, Entertainment News, Featured Articles, Gossip and Drama, Videos / LUOs know how to live life, See this video of a Gor fan and his son, Just Wow!!! 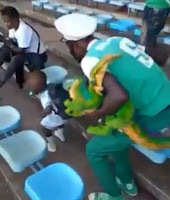 LUOs know how to live life, See this video of a Gor fan and his son, Just Wow!!! Wednesday, February 13, 2019 - Luos enjoy life to the fullest and forget about their troubles because at the end of the day, we shall leave this world with nothing. This Gor Mahia fan was spotted jamming to Arrow Boy’s Digi Digi hit with his son and the video is just amazing and funny.